What About The Child Who Grabs the Toy? When a child takes a toy from another child, he should be corrected. He has ignored another person’s rights. He has not treated the other child in the way he himself would like to be treated. 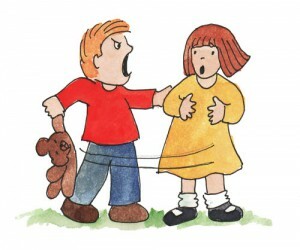 When this happens, the wronged child – the one who has lost his toy – will probably yell or cry. When this happens, it is easy, as parents, to focus on him because he is making the most noise. We may be tempted to correct him for not being willing to share, when we should actually be correcting the child who took the toy. The child who took the toy has, in essence, stolen. It is a childish form of stealing, certainly not like the premeditated theft of an older child or adult. But he has, as the dictionary defines stealing, “take[n] “the property of another or others without permission or right, especially secretly or by force.” The same root sin of self-centeredness is present in the one-year-old and in the teenager who both want something and wrongfully take it. Consistent discipline for the “small” acts of thievery committed by little children will prevent a hardening of conscience that could lead to greater selfishness, greed, and theft in later years. What does God say about stealing? We can teach this commandment to very little children. With babies who start to grab things from older siblings’ hands, we can say, “No, give the toy back to your brother.” We can guide him through the motions of giving back the toy, and discipline him if he resists our instruction. He will not understand much more than this, but he can understand that he needs to obey as you guide him in returning the toy. And he can learn to say (or sign) the word “please,” so that he is prepared to do the right thing the next time he would like a turn with a toy. With a toddler, we can say, “God says, ‘You shall not steal.’ You are taking something that is not yours. That is what God calls stealing. You need to give it back.” Again, if he refuses, he needs to be disciplined. This is a good time to also review what he should have done instead of taking the toy from the other child. Remind him to ask politely for a turn the next time, and to be patient and content if he has to wait. With prayer and consistency, we can teach our children to treat others the same way they want to be treated. This means honoring the rights of others, putting themselves in the other person’s place, not taking what belongs to someone else, and also being ready to be generous with what they have, willingly sharing with others.